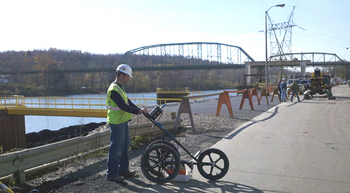 When a contractor wanted to avoid hitting any utilities that may be in or below a concrete roadway prior to cutting and digging, they called Ground Penetrating Radar Systems. A main roadway at a power plant’s facility was deteriorating and sections of it needed to be replaced. The contractor knew of a few utilities running just beneath the concrete and wanted to verify their depth, as well as search for any unknowns. GPRS was able to locate the utilities depth and location and mark them on the surface. For GPR projects or quotes in the Pittsburgh area or western Pennsylvania, contact Jake Lammott at (412) 292-3266 or email jake.lammott@gprsinc.com.